A typical Phuket low season week since the last weather blog update on May 14th. Some wet days and some amazingly sunny days that seem better than high season! On May 15th, I Tweeted "Some days in low season are better than high season. This is going to be one of them" - although there was a little rain later in the day. Weather in low season, most locals seem to agree, changes every few days. After 3 nice days you start to expect a wet day. And the wet days never seem to last more than 2 - 3 days. Well, the 16th was a WET day. My home rain gauge measured 67mm, with several heavy showers coming in from the sea during the day. A day for doing indoor activities! What does a wet low season day look like? Well, have a look at the video below, a timelapse from May 16th 2012 from the Patong Beach Webcam. 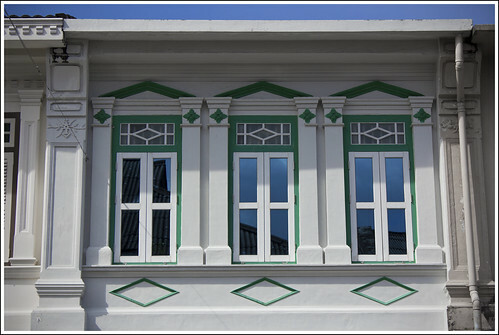 The kind of day when you might want to visit some of Phuket's Museums for example. Not a day to be out on the water! The morning in particular was rather nasty. You have to take the rough with the smooth in low season. I like the changes in the weather, I like a wet day after a few hot days. I like a hot day after a couple of wet days! Best thing about Phuket in the low season? If you are happy with changeable weather, one great advantage of coming in low season is that the hotel prices are way down on high season. 4 star resorts near the beach can be had for 1000 - 1500 Baht per night or even less sometimes. Better to have some customers than none, that's the theory! Have a look at Agoda.com for Phuket hotels, or my list of Phuket hotel recommendations. 17th and 18th May both had a little rain. Can be very isolated - on the 18th we had a big heavy downpour in the afternoon at Karon Beach, but my home rain gauge measured nothing that day. The few wetter days also came with wind. In low season, wind blows from the west or southwest, blowing right onto the beaches. On a windy day, when you see waves at the beach, it's best NOT to go swimming in the sea, especially at Karon Beach where the water gets deep quite quickly. People drown every year. The red flags are flying. Swim in the hotel pool if the sea is rough. I wrote about this a couple of years ago : Drownings at Phuket Beaches. Please stay safe. 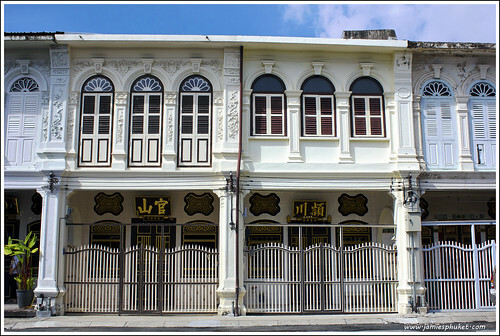 On Saturday 19th, I took a walk in old Phuket Town. There is a (slow, ongoing) project to remove overhead cables from the streets in the old town, and a couple more streets (Dibuk Road and Krabi Road) had been completed a couple of weeks ago. Looks great, and the weather on Saturday was also great. Too hot actually! Got sunburn working in the garden on Saturday, was a hot, hot afternoon! Sunday was even better! All blue skies, perfect holiday weather. But I got sick Sunday night and was at home all day yesterday. Will struggle in to work today for a while. Weather is decent today, but after a few hot days, we have to expect a wet one. I can see blue skies and large clouds from my window. Last image - I took this picture a couple of years ago. The 5 people in this picture are hopefully not going to drown. 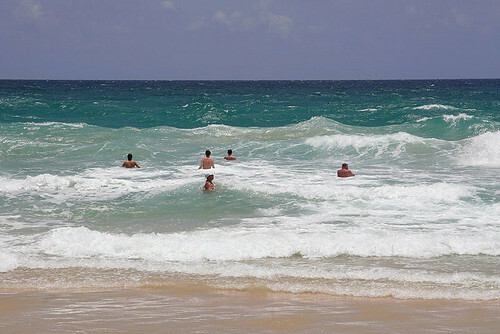 If you see waves like this at Karon Beach, don't swim. Stay safe.